Appareo Systems is the maker of Stratus transponders for ADS-B systems. United Airlines announces its goal to cut greenhouse emissions by 50%, Airbus is investing in synthetic spider silk for composite aerostructures, the fatal crash of a Cessna 335, flight attendants on bad behavior by emotional support animals. Also, a conversation about passing the Cirrus SF50 checkride. Kelly Keller flying in Alaska. Kelly Keller is the Central US Territory Manager for Appareo Systems, maker of the Stratus line of transponders for ADS-B systems. We explore the “hockey puck” and the “ghosting” effects and come to understand the implications if your airplane is ADS-B In equipped but not ADS-B Out equipped. Kelly also discusses the demand for installation and certification services and the increasing labor rates. 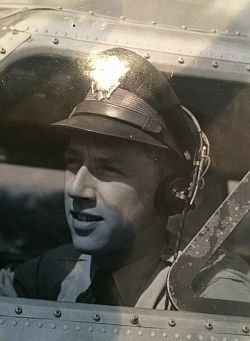 Kelly’s Grandfather in a B-17. Kelly attended the 2018 AOPA Santa Fe Fly-In and she shares her impressions from that event. Kelly is a third generation pilot. Her grandfather was a WWII B-17 bomber pilot who flew two tours in the European theater, and her father was a Vietnam veteran, an airline pilot, an A&P/IA, and an avid advocate for general aviation. 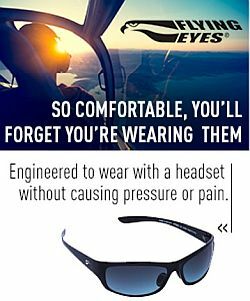 Kelly has been a private pilot since 2010, with ASEL and ASES class ratings. She’s currently finishing up her instrument rating. 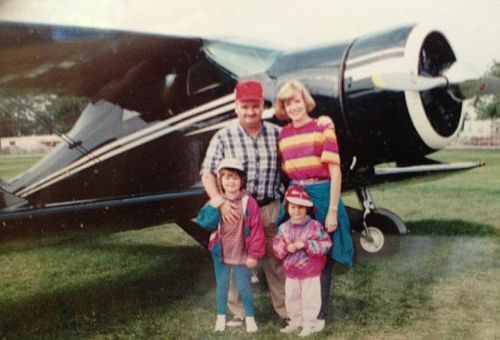 Kelly’s family in front of the Staggerwing at Oshkosh. United Airlines CEO Oscar Munoz says, “…United Airlines became the first U.S. airline to make a public commitment to reduce our own greenhouse gas emissions – 50 percent by the year 2050.” This will be accomplished through engine and airframe technology developments, and the use of biofuels. United made an aviation fuel purchase agreement with Fulcrum BioEnergy, and the airline celebrated their commitment with the longest transatlantic biofuel flight to date, from San Francisco to Zurich. See also: Major air carriers plan to use more biofuels. Airbus partnered with AMSilk to develop a prototype composite material composed of Biosteel fiber and resin. AMSilk is a German company that produces Biosteel in the lab which is designed to mimic spider silk in terms of flexibility and strength. Biosteel is created through a “closed-loop, bacterial fermentation process.” They hope to debut the composite in 2019. A Cessna 335 recently crashed on approach to Florida’s Palm Beach County Park/Lantana Airport. 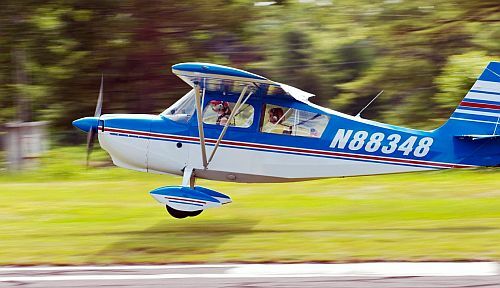 The twin-engine airplane hit the ground a mile from the airport, killing the pilot and his wife. The man did not hold a valid pilot certificate. In fact, his certificate had been revoked in 1997 “for making fraudulent or intentionally false statements on his application for a medical certificate.” See also, Crash Pilot Had Certificate Revoked. In its survey Emotional Support Animals Negatively Affecting Air Travel, the Association of Flight Attendants asked about 5,000 flight attendants across 30 airlines for their experiences with emotional support animals. The results are concerning and the AFA has called on the Department of Transportation to take action to limit abuse. Audi Stuart Air Show, November 2-4, 2018 in Stuart, Florida. Cirrus Aircraft Vision Jet – Max Trescott tells us about his experience passing his checkride on the SF50. Brian will be attending Dorkfest 2018. The Aviation is Your Future self-paced Massive Open Online Course (MOOC) celebrates Girls in Aviation Day on October 13. This course is a project of the Woman in Aviation International Chapter at Embry-Riddle Aeronautical University – Worldwide. Oct 8 – Oct 22, 2018. How do you move 11 whales and dolphins 1,000 miles? This entry was posted in Episodes and tagged accident, ADS-B, Airbus, AMSilk, AOPA, Appareo, Biofuel, Cirrus, Delta Air Lines, Embry Riddle, Flight Attendant, Fulcrum BioEnergy, service animals, United Airlines, women in aviation on September 19, 2018 by maxflight.